A big thank-you to everyone who submitted work to Volition this semester. The Fall 2017 issue is coming soon! 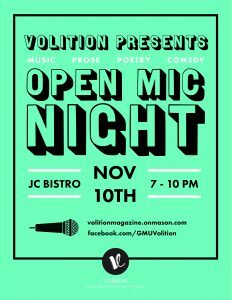 In the meantime, our second Open Mic Night is on Friday, Nov. 10 from 7–10 PM in the JC Bistro. There will be music, prose, poetry, comedy, and food! Invite your friends!